On the 2nd of August, the Germans occupied Luxemburg, without opposition. The order went out to all border posts along all Belgian frontiers, to open fire on any hostile troops attempting to cross into Belgium. On the same day, the German Ambassador in Brussels presented the Belgian Foreign Office with a letter. Or rather, an ultimatum. On the pretext that France was about to attack Belgium, the Germans demanded free passage through Belgian territory. It was briefly discussed by the Belgian Cabinet, and one hour later unanimously rejected. On the 3rd, the French commenced hostilities against Germany, and Joffre ordered the VII Corps to move forward to capture Mulhouse. (As an aside, their commander, General Bonneau, prevaricated, took two days to reach the town - it was only 15 miles from his base - neglected to reconnoitre or make defensive positions and re-lost it two days later). The Germans moved more men into Luxemburg. It was only on this day that the Belgian GHQ finally decided how to deploy their army. The 3rd Division under General Leman were ordered to Liege, and the 4th, under Michel, to Namur, to hold on to the bitter end. The 1st Division left Gent for Tienen, the 2nd went from Antwerp to Leuven, the 5th from Mons to Perwez, and the 6th moved on Wavre, from the capital. At dawn on the 4th, orders were received by advanced German units that they should execute the next step of the Schlieffen Plan; the destruction or capture of Liege. Units crossed into Belgium at six different places. The fortress buildings at Liege and Namur were constructed between 1888 and 1892 under the direction of military engineer Brialmont. The town of Huy was also strengthened at that time, but was not really equipped as strongly as the two main fortresses. 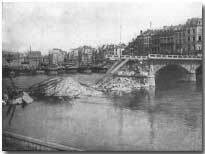 Liege was ringed by twelve forts, at a rough distance of 7km from the centre, six on each bank of the Meuse (Maas). Each consisted of a massive concrete crown, surrounded by a wide and deep moat. On the far side of the moat was a high earth breastwork. The defensive works were constructed of steel and concrete and for the most part were underground. The forts carried quite an armament : two 210mm howitzers, two 150mm and four 120mm cannon. Each artillery piece was behind a rotating cupola turret. There was also several smaller calibre pieces, and machine guns, beyond the moat and in the spaces between the forts, which were also wired in places. However, the spaces between the forts were the obvious targets of the advancing Germans. The Belgian troops were ordered to knock down any houses or other buildings that were in the field of fire; but little of this was achieved due to the speed of the advance. The fortresses were occupied by the oldest classes of soldier, in this case the 9th, 11th, 12th and 14th regiments, together with some engineer and transport units. The 3rd Infantry Division under Leman had also been ordered forward, and was taking up positions around the fortress ring. The 14th Brigade was placed in the most vulnerable position, on the right bank (to the east of the town facing Luxemburg), and a battalion was sent to defend the Meuse crossings at Visé and Argentau. The Germans planned to knock out the forts and capture Liege inside three days. In fact, it was only on the eleventh day that the final resistance was overcome. Their strategy was one of envelopment : they would capture the forts to the North, West and South of the city. The advance units of the 2nd and 4th Cavalry Divisions first attacked Visé, where there was an important bridge over the Meuse. The 9th Cavalry moved towards the South, between Huy and Liege. Six infantry brigades, with an attached battalion of jagers (guards), plus cyclists, pioneers, artillery and other support moved on the East side. A squadron of eindeckers, and the Zeppelin Köln provided air cover and observation. The Germans advanced cautiously, for in the wooded folds of hills, and on the river meadows, they faced unexpectedly ferocious resistance from the Belgian forts and 3rd Division. Gradually and inevitably, weight of numbers and fire told on the Belgians, who began to withdraw. Some fell back to the river banks and city. Some entered the forts. The latter had sentenced themselves to almost certain death or captivity. After two days, on 6th August, the city came under fire. Conditions became increasingly unsafe, and rumours went round that the Germans were already there. At 7.30am, an Army Order was given for a regrouping of the 3rd Division between Lantin and Rocourt, and the railway station at Ans. It was considered better for the weakened division to withdraw towards the Gette than to lose more men in the futile defence of Liege. Shortly after midday, the first column withdrew to Waremme. The rest of the division followed through by next morning (7th). Lieut-Gen. Leman and his headquarters staff stayed behind, with the fortress troops. At 6am on the 7th, the German 14th Brigade entered the city. The occupation of the city was hastened by a Belgian spy, who gave a telephoned order, on the authority of Leman, to withdraw from the centre. The General on the spot did not check the authorisation, and carried out the order. The spy was one Charles Troupin. He had first been arrested at Waremme on the 7th August, when a Belgian road patrol spotted a false 'laissez-faire' pass. He escaped. He was finally caught, with two others, at Leuven on the 16th August, where he was sentenced to death and executed. From the Chartreuse, Ludendorff's men turned towards the Meuse, crossed the two undamaged bridges and entered the inner town. Ludendorff travelled in the delusion that the city was already completely in the hands of his men, and rode with an adjutant to the gates of the Citadel. Shortly after, the other Brigades reached the city centre, and the final Belgian resistance halted. The guns of the forts continued to fire. Von Emmenich threatened to bomb the old town by Zeppelin. Leman continued to refuse to surrender. The news was telegraphed through to Leuven and Brussels. The Government was moved, under the orders of King Albert, to Antwerp. The intention of the Belgians to fall back on Antwerp was against the will of the French. The news from the fighting of the first days was not published or relayed back to the towns to the north. The General Staff continued to issue very upbeat communiqués. Passions high against the invader, put the flags out, was very much the order of the day, except in the shattered villages outside Liege. Meanwhile, the cavalry of Von Marwitz tried to encircle the Belgian troops to the South and West, while the infantry under Von Einem regrouped. There was a steady flow of German troops across the border from the area of Aachen, Eupen and Malmedy towards the fortress ring. The whole of the 7th,9th and 10th Korps assembled. The German plan was to open the road to the North of the city, after which the 1st Korps would march on Brussels. Inevitably under constant and increasing fire, the forts began to fall. Fort Barchon was first. A bombardment by heavy 210mm Skoda mortars ended the resistance, and at 5pm on the 8th August the remainder of the garrison surrendered. The Germans promptly began the big engineering job of moving the mortars to a position where they could fire on Evegnee. They opened fire on the evening of the 10th, and the white flag was raised the following morning. 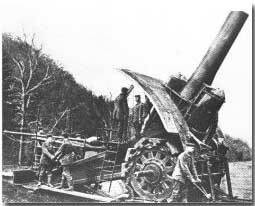 From the 12th August, even heavier guns became available to the Germans as the first of the 420mm mortars opened up. The first shell missed its target - but when, following corrections made by observation from a balloon, the fire moved slowly onto target. Fort Pontisse fell soon after, on the afternoon of the 13th. Three quarters of the garrison of the fort died, many from smoke and concussion from the huge explosions. The same day, Embourg and Chaudfontaine fell. At the latter, hundreds died at the same moment when a heavy shell struck the munitions store. Fort Liers stood for a further day, as Belgian artillery fire from Milmort was so effective that it held the Germans at some distance. On the same day, the 14th, the garrison commander of Fort Fleron, Capt Mozin, decided that after 50 hours of continuous bombardment, his remaining men could stand no more. Fleron had provided strong resistance to German assaults for 5 days, and at the same time had provided very effective artillery support to the other forts. Boncelles fell on the same day, and the Germans now had complete control of the right bank. Leman's HQ did not escape. The first shells fell on the 10th. From the 14th it received 420mm shells, and it finally fell on the next day when a shell blew up the magazine. All of the internal doors blew open with the pressure from the blast, and many men were hit with debris. Not a single man remained unwounded. Shortly after this, the Germans saw that the gun cupolas were no longer firing, and infantry assaulted the ramparts. Leman, and the fort commander Capt Naessens, were brought out unconscious and taken to a German military hospital. Leman was born in January 1851, making him 63 when the battle took place. He was transported to Germany, where he remained a prisoner of war until he was repatriated to Switzerland due to ill health, in 1917. He was interned there until release at the Armistice. He died in October 1920. Article contributed by Chris Baker, website.